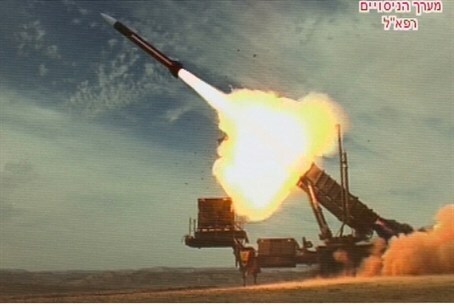 Patriot missile downs rogue aircraft; wreckage hits Syrian side. Reports vary: aircraft was a MiG-21 or a Sukhoi-24. Israel shot down a Syrian aircraft on Tuesday as it attempted to fly over the ceasefire line into the Golan Heights, according to IDF Radio. "This Syrian aircraft, apparently a MiG-21 (fighter jet), which was approaching the Israeli side of the Golan, was shot down by a surface-to-air Patriot missile," the radio said. The wreckage of the aircraft landed on the Syrian-controlled side of the strategic plateau, it added. Other reports claimed the aircraft was a Sukhoi-24. Initial reports that it may have been a UAV appear to have been discredited. The IDF has launched an investigation into the incident. Defense Minister Moshe Yaalon warned Tuesday afternoon that Israel would respond to further incident "forcefully." "We will not allow anyone, whether it is a state actor or a terror organization, to threaten our security and breach our sovereignty," he said in a statement. "We will respond forcefully against any such attempt, whether it is an error or intentional." Tuesday's spillover is far from the first such incident since rebel forces started their latest successful campaign to wrest control of the region from Syrian President Bashar Assad's forces. While mortar shells and rocket fire from the region have characterized most of the Syrian-Israel border tensions, Israel also shot down a Syrian drone after it strayed into Israeli airspace late last month. But Tuesday marked the first time Israel had shot down a piloted Syrian plane since 1985 and drew a sharp response from Damascus. Damascus said the downing of its fighter jet showed Israel's support for the rebels on the Golan, who include Al-Qaeda loyalists who held 45 UN peacekeepers hostage for two weeks before releasing them earlier this month.